This beguiling Precious Palace is an extraordinarily luxurious take on the original Marie Antoinette Palace. Here, designer Betsy Boggs interprets the Queen�s original 18th century kennel design in handcrafted rich walnut and a gorgeous traditional French paisley. It has a modern, yet warm opulence that maintains its royal lineage. 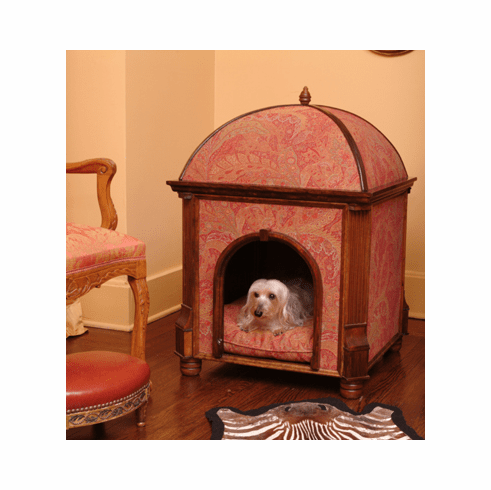 All palaces are custom designed with the pet and owner�s needs in mind. Clients may select from a range of fabrics, leather, suede and finishes. This designer pet bed will offer your pet the comfort they deserve. All of these fabrics are of very high grade materials. Dimensions: 24"W. x 24"D. x 35"H.